NEC Display Solutions of America, Inc. today announced the launch of InfinityBoard, a tool for interactive meetings that offers Mosaic Hub collaboration software, flexibility via multi-platform support, and ease of purchase for enterprise customers.The InfinityBoard collaboration solution is designed for corporate and higher education customers and includes an NEC Display UHD display with in-glass touch, with screen sizes ranging from 55” to 84”, a Huddly camera with a 120-degree viewing angle for productive videoconferencing, 40-watt conference speakers, and a passive pen for a natural writing experience. 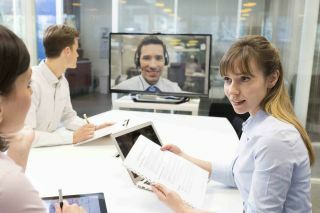 In addition, InfinityBoard features an OPS slot-in PC, and the Mosaic suite of collaboration software that includes video conferencing, messaging, whiteboarding, and wireless sharing functionality. Later updates will further increase capabilities with integrated native support for popular business tools. InfinityBoard is available this month with the 3720-INF2-55, 3720-INF2-75, and 3720-INF2-86 screen sizes. The 3720-INF2-65 size will be available in early 2019. For additional information and specs, visit NEC Display Solutions.